[S339] Obituary of Mrs. Cliff Kelley, Wed. Dec. 16, 1908. Thomas Brannen was born circa 1794 at probably Screven, Georgia, United States. He was the son of "Progenitor" Brannen. Thomas Brannen married Nancy Donaldson, daughter of Robert Donaldson and Peggy Irwin, circa 1815. He married Sarah Ann (--?--), circa 1842 at Lowndes, Georgia, United States. Thomas died circa 1865 at Cedar Key, Levy, Florida, United States. We believe the father of Thomas Brannen (1794-1865) is either John Brannen (1765) or Henry Brannen (1755) both of Screven County, Georgia. We found four Brannen males old enough to be the father of Thomas and living in the Screven/Bulloch County Georgia in the 1790's. They are Thomas Brannen (1770), Henry Brannen (1755), John Brannen (1765) and William Brannen (1745). The families of Thomas and William have been well researched and their children identified and well documented. Unfortunately there is no Thomas Brannen born about 1794 listed among those children. That leaves Thomas (1794) as likely being the child of Henry Brannen (1755) or John Brannen (1765). For purposes of including Thomas in this genealogy we have shown him as the father of "Progenitor" Brannen until we find further information to show where he fits. Based on these census records we have chosen his birth year as circa 1794, based primarily on the 1850 census. However, it is clear that he could have been born several years earlier. Thomas Brannen (1794-1868) is the progenitor of most of the Brannen families in Suwannee and Taylor County, Florida. Thomas was born about 1794 probably in Screven County, Georgia. He married Nancy Donaldson about 1816 in Bulloch Co. and started his family. Between 1826 and 1830 he moved his family to Lowndes Co. Georgia and about 1843 he moved his family into Madison County Florida near Cherry Lake as that is where they were located on the 1850 Census. By 1860 the family is in the northern part of Taylor Co., Florida where descendants remain to this day. Thomas Brannan is listed as head of household in the 1820 Federal Census of Bulloch Co., Georgia. His household consists of 1 male age 26-45 (Thomas) 1 male age <10 (Robert H.), 1 female 16-26 (Nancy) and two females <10 (Mary and Martha). A record showing Thomas Brannan enlisting as a private in Turner's Company, 12 Reg't, 1st Brigade of the Florida Mounted Volunteers in the Florida Indian Wars. A William and a Robert H. Brannan also enrolled in the same company at the same time. These being his two sons who would be of sufficient age to join the militia. The date of this record is unknown but it most likely was between 1836 and 1840. A Thomas Brannin as well as, a Robert and William Brannin enlisted in Capt. Hills (This is Green Berry Hill, next door neighbor of Thomas and friend of Robert Donaldson) Company, 2nd Regiment, Florida Mounted Volunteers as Privates. They all enrolled June 16, 1837 at San Pedro for 6 months and were on the muster out rolls for this Company at Ft. Gilliland, Florida on 18 December 1837. [National Archives, Microfilm M-629, Index to Service Records Indian Wars 1815-1858] These records suggest that these are two separate enrollments at two different times by the same persons. In addition there are three records for a Henry Brannan who served in Livingston Co. of Taylor's Bttn of Middle FL Vols, in Bradley's Co. of FL Mtd Vols and in Capt. Holloman's Co. of McCant's Bttn in the the Jefferson County Middle FL Drafted Mil in the Florida Indian Wars. We have not been able to identify or locate this Henry in other records and are very suspicions that this Henry is in fact, our Thomas Brannen (1794). There are also James and Bryant Brannen, children of John Brannen (1765) also are found serving in other companies during these wars. Thomas is listed as head of household in the 1840 Census of Lowndes Co., Georgia as follows: 2m 5/10 (Franklin & John) , 3 m 10/15 (Owen, William, James) 1 m 15/20 (Robert H.), 1m 40/50(Thomas) 1 f 10/15 (Margaret) 1f 40/50 (Nancy). Mary and Martha are married before 1840 and thus do not appear. His first wife Nancy Donaldson must have died circa 1843 as he likely married his second wife Sarah Ann circa 1843 based on having their first child Houston, by Sarah Ann, in November of 1844. Thomas, William, Bryant, James, Rachel and Robert Brannan all appear on the 1847 Tax List in Madison County, Florida. Bryant, James and Rachel are the children of John Brannen (1765) of Screven County. William and Robert are sons of Thomas. There is obviously a very close relationship between James, Rachel and Bryant, children of John Brannen (1765) of Screven County, Georgia and Thomas Brannen. They are living near each other in the 1840 census and James is living next door to Thomas in the 1850 Madison County Census. Rachel and Bryant are also living in the household of James in 1840, but could not be found in any records after their names appear on the 1847 Madison County, Florida tax list. 1850 Madison Co. FL - Federal Census - 22 Nov 1850 11th Div. In the 1850 Census of Madison County, Thomas's son Hampton, (His name of Houston is misspelled) is shown as age 6, born Florida. This is the first of Thomas's children born in Florida which suggests he moved into Madison County, Florida from Lowndes Co. Georgia between 1842 and 1844 as his name did not appear on the list of 1842 voters seeking statehood for Florida. James Brannan (1798) son of John Brannen (1765) of Screven County Georgia and family is enumerated as a next door neighbor to Thomas in the 1840 Lowndes Co. Georgia Census and the 1850 Madison Co., Florida census. This is likely the same James that served in the Indian Wars. Thomas is listed on the 1856 and 1859 tax scrolls in Taylor Co. Florida as H. T. Brannen. It is not sure where the H. came from as these are the earliest records where the H. appears. This suggests that Thomas's first name may be Henry (names that appear in this family) and that he may have been named after his father. He may have also used the name Henry durng the Indian Wars and may be the Henry Brannen that served in those wars. More research needs to be done on this issue to clarify this matter. Thomas is enumerated in the 1860 census of Taylor Co., Florida. However, he is not enumerated with his wife, Sarah and family, in the 1870 census of Taylor Co., Florida and is not on the 1868 Tax scrolls of Taylor Co., Florida. This suggests he died prior to 1868. "When Thomas Brannan Come to Fla. from Bulloch County, GA. Dady said that they stayed for awhile in Quitman, and he thought they may have stayed in the Lowndes County around Valdosta for a short time. When in 1850 he was living in Madison County, they were living up around Cherry Lake. He owned 13 slaves. When they left Cherry Lake, they settled out from Shady Grove, and Uncle Sam Lived on the old homestead There. Dady and Uncle Perry Day both took up a home stead there, and i think that that is where I was born." "During the Civil War, at the end of each farm season, the govt. would come through and take a portion of each farmers' Crop. I heard them say that Our Great GrandPa didn't like that too much, so he told them that they wouldn't get anything more from his Farm. So they sent the wrecking crew out (I rember studying about them in Fla history, but I can't remember what they were called. any way, they burned his house and all the Slaves Cabins. Granddady was 18, so he refused to join the Southern army., He joined up with the North, and they sent the rest of his family to Ceder Key, since the North at that time had captured the Island of Ceder Key; and took the Families of the Southern Soldiers there so they could protect them, as they could be killed." "While there! during the Civil War our Great-Granddady, died from an epidemic of scurvey, and that is where he was buried. Several years ago, after we learned about this, Jessie, Lawton, Pearl, Edd and myself went to Ceder Key and went through two Cemeteries, but could'nt find where he was buried. One of the Cemeteries was real old, and there were lots of great big pine trees growing right on the graves. we figured that it must be that one, since no one would care enough to clean up where someone was buried that was against the South. After the war, out great Grand mother and Uncle Sam was sent to Tallahassee, and finally released to come home. One of Uncle Sams daughter's, Maude, is still living in a nursing Home in Perry. She told me that her Dady and our Greatgrand mother, who had to be getting old at that time, walked from Tallahassee to Shady Grove to get back home. She is buried in Fellowship Cemetery, and I have found out about the spot, but there is no marker to her grave." Based upon this family oral tradition we have estimated that Thomas died about 1865, near the end of the war, at Cedar Key, Florida and is buried there. During the Civil War the blockade of Confederate ports played a major role in determining the outcome of the war. After Union forces cut off the supply of beef from west of the Mississippi, the Confederate Government turned to Florida for beef and salt. The blockade of the West Coast of Florida fell upon the East Gulf Blockading Squadron (EGBS) of the US Navy. It was this squadron that was directly responsible for the formation of the Second Florida Cavalry. Through a series of events, individuals including the family of Thomas Brannen turned to the EGBS for protection after deserting from the Confederate Army. In turn these refugees and deserters provided intelligence information and beef to the sailors. Eventually many of the families were relocated to Key West, Egmont Key in Tampa Bay and Cedar Key. Over time many of the refugees took the Oath of Allegiance and became sailors in the US Navy. Others worked with the blockaders and became members of the 2nd FL Cavalry. In the summer and fall of 1863, Acting Master’s Mate Henry A. Crane of the sloop USS Rosalie began working with refugees in the Charlotte Harbor area. Charlotte Harbor was the port used by blockade-runners shipping beef to Havana. Crane, a former army officer in the Seminole Wars, used the influence of Enoch Daniels to approach the army and navy commanders in South Florida about using refugee Floridians to fight for the Union. This was the seed that would become the 2nd FL Cavalry. Among the refugees near Charlotte Harbor was Milledge Brannen. It is not clear if he is related to the Thomas Brannen family. What is known is that he was born in Columbia County and moved to Charlotte Harbor after deserting the Confederate Army. He had served in the Seminole War and enlisted in Co K, 8th Florida Infantry after attaining the rank of second lieutenant. He deserted after the company reorganized and was not selected for a commission. Milledge assisted the Rosalie in the capture of blockade-runners on the Peace River. There is no mention of Milledge enlisting in the Union army or navy. As for the members of the Thomas Brannen family, many began military service with the Confederate Army but deserted and returned home due to various reasons. Once in the Taylor County area John R. Brannen associated himself with William W. Strickland. Strickland deserted after being refused leave to visit his seriously ill wife. To avoid conscription agents he moved deep into the swamps of the Ecofina River and formed what became known as the Independent Union Rangers of Taylor County. John R. and William A. Brannen (unknown if related) were members found on a muster roll recognized as William Strickland’s band. Along with Francis J. Brannen, Houston Brannen, James F. Cruce and Thomas O. Cruce they joined the Union Army and served in the 2nd FL Cavalry. The 2nd FL Cavalry participated in operations involving cattle raids and the destruction of coastal salt works. These operations were supported by the EGBS and US Colored Troops from St. Vincent to Charlotte Harbor. In March 1865 the 2nd FL Cavalry was involved in a plan to capture Tallahassee. These plans include joint operations of the army and navy with six members of the 2nd acting as saboteurs to destroy a railroad trestle over the Aucilla River. The tracks were to be torn up in order to prevent Confederate reinforcements arriving. It was hoped that tearing up the tracks would send the train and it’s passengers into the river. Among the six members detailed were William W. Strickland and John R. Brannen, with Strickland in command. Strickland decided to burn the trestle rather than tear up the tracks in order to give warning to the engineer of the train. However, the train managed to make it over the trestle and arrived at the next station. A Dr. Treadwell led ten mounted men with hounds back to the trestle to capture the saboteurs. Shortly thereafter the dogs caught the scent and the men of the 2nd Cavalry were surrounded. During the capture three of the men were killed and one escaped. Strickland and Brannen were captured and taken to Tallahassee. Both were said to be wearing blue uniforms. Confederates then defeated the Union forces at Natural Bridge. In Tallahassee John Brannen and William Strickland were found to be deserters and were court-martialed. Both were convicted and sentenced to death by firing squad on March 18,1865. The execution took place on the top of a hill just south of the capital. In the center of the field two green pine saplings were placed in the ground twenty feet apart. The troops serving as the firing squad were mustered and marched to within twenty feet of the condemned men. The command to fire was given and both men shot. The account of the capture and execution of John Brannen and William Strickland is found in " My Recollection of the Confederate War" by S. M. Hankins, Cpl. CSA. Cpl. Hankins was on board the train to be derailed at the Aucilla trestle and present at the execution. Originally he was selected to be among the firing squad but begged to be relieved from that duty. His typescript can be found in the Florida Archives in Tallahassee. Other material was taken from "Blockaders, Refugees, & Contrabands" by George E. Buker. Sarah was born circa 1812 at Georgia, United States.1 She married Thomas Brannen, son of "Progenitor" Brannen, circa 1842 at Lowndes, Georgia, United States. Sarah is listed as Sallie G., mother, living with Samuel B. Brannen in the 1880 Census of Taylor Co. The initial G. is possibly the first letter of her maiden name. That census shows both her parents were born Georgia. She was born Florida. However, earlier census records indicate she was born in Georgia which we believe to be correct. [S31] 1850 Census Madison FL, Family of Thomas Brannen, p. 104, dw. 319, fam. 319. Houston was born on 28 November 1843 at Madison, Florida, United States.1 He was the son of Thomas Brannen and Sarah Ann (--?--). Francis was born circa 1832 at Lowndes, Georgia, United States.1 He was the son of Thomas Brannen and Nancy Donaldson. He married Catherine (--?--), circa 1855. Francis J. "Frank" Brannen married Welthey E. Sheffield. 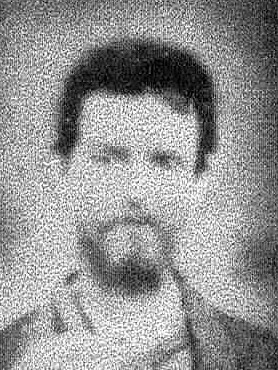 Francis J. Brannen, at age 32, enlisted in the Army of the United States (Union) for a three year enlistment on 6 April 1864 at the same time and place as his brother, John and half brother Houston enlisted. He was recruited in Taylor County, Florida by Lt. Thomas Hunter. His enlistment papers show he had blue eyes, dark hair, fair complexion and was six feet in height. His service records show he was immediately assigned as a Private in Company C, 2nd Florida Cavalry at St. Vincents Island, Florida. His military records also indicate he was a "Refugee from the Confederacy". He was promoted to Corporal on June 10, 1864. He was reported in Sept. 1864 as "Detached on scout to Ecofina river since Sept. 22." He was reported as absent on the January/February 1865 muster roll because he was on detachment at Cedar Keys. In March/April 1865 muster roll he was reported as being "absent sick at North Key". He was mustered out of service at Tallahassee, Florida on November 24, 1865. John was born circa 1834 at Lowndes, Georgia, United States.1 He was the son of Thomas Brannen and Nancy Donaldson. John died on 17 March 1865 at Tallahassee, Leon, Florida, United States. John Brannen, at age 24. enlisted in the Army of the United States (Union) for a three year enlistment on 6 April 1864 along with his brother, Francis and half brother, Houston. He was recruited in Taylor County, Florida by Lt. Thomas Hunter. His enlistment papers show he had blue eyes, brown hair, fair complexion and was five feet eight inches high. His service records show he was immediately assigned as a Private in Company D, 2nd Florida Cavalry at St. Vincents Island, Florida on April 18, 1864. His military papers also indicate he was a "Refugee from the Confederacy". He was reported in January/February as "On Attached Service as a scout. On the March/April Muster Roll it is noted "Went out as a scout Mar. 6 /65 and captured by the enemy." A return dated April 1, 1865 shows: Missing in action at Natural Bridge, Florida, Mar 6 65 To be executed at Tallahassee March 17. Ancilla Trestle March 4." Another return dated March 1865 shows: Mar 4, 65 Ancilla trestle, Fla. Missing in Action. On his muster out Roll dated 29 November, 1865 in Tallahassee, Florida is the remark "Private was sent out as scout Mar. 6/65 and was killed by the enemy." [Service Records of John Brannan, Co. D, 2nd Florida Cavalry, Union Army - National Archive, Washington, D. C.] These records indicate that John Brannen was a scout for the Union Army and he was captured at or near the Ancilla River trestle bridge or Natural Bridge, Florida on 6 March 1865. He was then executed by Confederate Forces at Tallahassee on 17 March 1865. Nathan was born circa 1846 at Madison, Florida, United States.1 He was the son of Thomas Brannen and Sarah Ann (--?--). Nathan P. died young per Lily Brannen (1916-1994) letter of 1992. Samuel was born on 1 October 1850 at Madison, Florida, United States.1 He was the son of Thomas Brannen and Sarah Ann (--?--). Levinna was born in August 1852 at Madison, Florida, United States. She was the daughter of Thomas Brannen and Sarah Ann (--?--). Lavina was tall, lean-looking per Lily Brannen.